Pardon the Punctuation...If you have never been blessed with the chance of going to the Food and Wine Classic in Aspen, get your 2014 tickets now!!!!! I'm in a daze after having just landed from this foodie haven just a few short hours ago. Gotta pinch myself. Rarely do you get the chance to rub elbows with some of the most innovative chefs and food peeps in the business. Over the next few days I'm gonna give you some of the highlights of my time at this fabulous event. There is so much to write about that I'll get right to the point. 1.Silver Fern Farms Grass Fed New Zealand Lamb Chops: Can't lie to you but I'm a sucker for a good lamb chop. 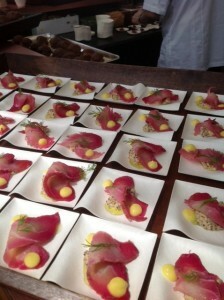 Every food and wine event has dishes that come as a pleasant surprise and this was one of them. These are grass-fed, free range, and pasture raised lamb chops. Lambs is something I've had at some of the best restaurants in the world and these were the best I've ever had...there I said it and I stand by it. These lamb chops are so tender that your grandma can take off her dentures and gum them down...yum!!!!! 2.Chef Bruno Davaillon: The chef from Rosewood Mansion on Turtle Creek in Dallas was the talk of the event as his creations were innovative and mouth watering. 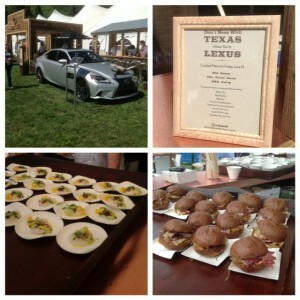 He held the throne at the Lexus tent and was killing the competition with every dish. These were my fav of his bites. Beef Tartare: with tarragon aioli, horseradish, and pickled ramps. The flavors melded together perfectly and the tarragon aioli was the perfect touch. Scallop Ceviche: with Jalapeno pudding, pickled mango, and crispy quinoa. Holy sh*t that was some amazing ceviche. A beautiful scallop with just a little heat and a nice texture courtesy of the crispy quinoa. Pastrami Reuben: with braised cabbage, comte cheese, and russian dressing. I can't lie...I ate like 3 of them. I think chef must have sprinkled crack on them or something. Purely addictive. Beet-Cured Sturgeon: with quinoa yogurt and citrus pudding. First off the presentation was a work of art and the taste matched it. Beets and sturgeon aren't two things I'd ever think to put together. What a creation...my compliments to the chef! I need to get my hands on some of that lamb so I can do a video recipe for you guys. I have one in mind that will rock your world! If you're in Dallas make sure to make your way to the Rosewood Mansion on Turtle Creek and try Bruno's food. Trust me, it will be a memorable experience in a good way. Can't wait to get to the lone star state to have his food again!